Roy Wood [plus 61 others] wishing it was Christmas every day! Hello ... Hello ... my old friends ... It's great to see you once again! 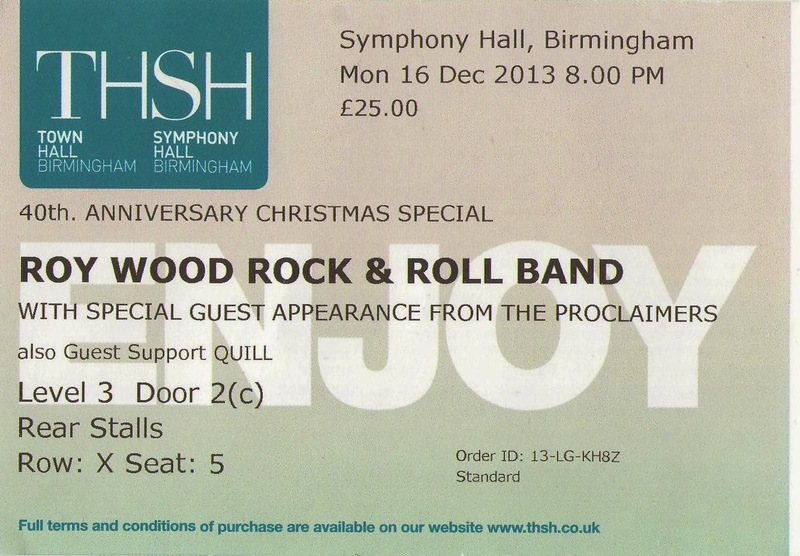 The much anticipated return of Roy Wood to Birmingham Symphony Hall with his Rock 'n' Roll Band more than exceeded the expectations of the assembled full house on Monday night [16th December] as we witnessed the spectacle that was the 40th Anniversary of Roy's seminal festive hit "I Wish It Could Be Christmas Everyday" back in the day with Wizzard. Quill were simply superb on the night! Special guests Quill commenced the proceedings with an energetic and classy forty five minute set that showcased their own musical legacy as they delivered a selection of their own compositions and covers including "Say It Ain't So", "Galway Girl", "Harvest", "Jig-A-Jig", "England" and the barnstorming finale "Whiskey In The Jar" to the appreciative audience. The highlight of their tenure on the stage had to be Joy Strachan-Brain delivering the title track from their newly released EP "Life Is Life". Quill were totally at ease with themselves and, I'm sure, made many new friends here. The first surprise of the evening was the appearance of the one of Roy's long time friends Jasper Carrott. The star of the successful "Made In Brum" tour earlier this year had the audience in stitches for a quarter of an hour with his comedic observations on growing old disgracefully! 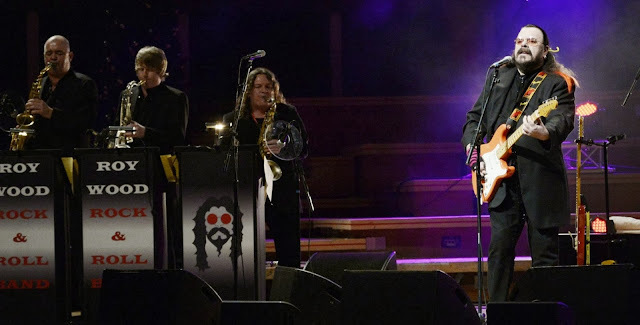 Jasper ably introduced Roy as his band preceded him and readied the took their place on the stage and awaited the arrival of the former Move, ELO and Wizzard man in front of the assembled cameramen, who were filming the event both for television and promotional purposes. Roy Wood and his multi-talented Rock 'n' Roll Band then went to produced an inspired live journey through his self-penned classics, taking in all the hits plus the odd trip down memory lane and some delightful banter with those in attendance. 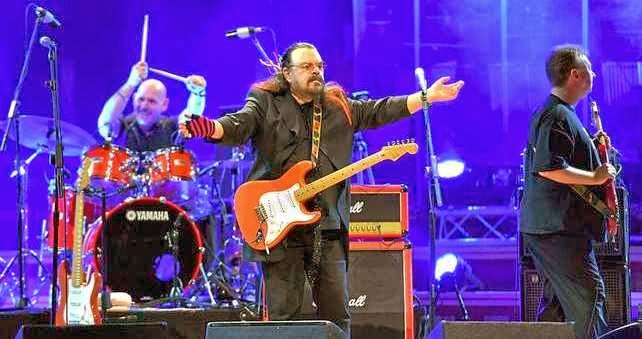 It was sheer delight to see the multi-instrumentalist and song writing genius in his element performing songs in front of his many fans and admirers such as: "California Man", "Angel Fingers", "Fire Brigade", "I Can Hear The Grass Grow", "Are You Ready To Rock? ", "See My Baby Jive" and "Ball Park Incident" as well as the more recent "Boadicea" and "New York City". Halfway through his set, as promised, Roy invited Charlie and Craig Reid to join him. And Scottish duo: The Proclaimers then delivered a rousing four song mini-set including, naturally, their own anthems "Letter From America" and "I'm Gonna Be [500 Miles]", the latter of which brought the those watching to their their feet as the festive party atmosphere enveloped those watching. The next surprise was the arrival on stage of the acclaimed classical octet The Enigma Strings, who added a surreal ELOesque flavour to the evening thereafter as Roy informed us, after we had listened to "Flowers In The Rain", that he had originally intended "Blackberry Way" to be orchestrated back in the day but was "... denied by the powers that be" at the time. He then gleefully informed that he was the boss now and we were then treated to this new old [or was that the old new arrangement?] of the classic Move anthem live for the first time, just as it appeared on Roy's 2011 release "Music Book". And, believe me, it sounded superb! Quite naturally, the climax of a fantastic night had to be a very special version of "I Wish It Could Be Christmas Every Day". So as The Proclaimers returned to the stage, we received our third surprise of a memorable night when The Stockland Green School Junior Choir - appeared on stage [featuring some of the sons and daughters of those in the original recording!] and joined Roy as he belted out his well-loved seasonal hit with a little help from his friends. 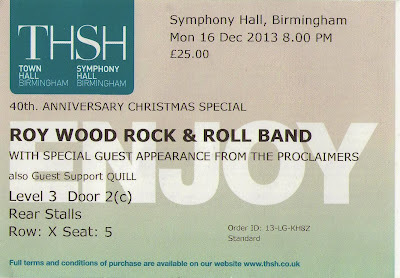 Indeed, there were 62 folks on stage at the end of a truly fantastic evening of top class entertainment. The Roy Wood Rock 'n' Roll Band were: Roy Wood [Lead vocals/Guitars/Bagpipes]; Danny McCormack [Keyboards]; Shell Naylor [Vocals/Tambourine]; Neil Simpson [Bass]; Roy Adams [Drums]; Paul Corry [Saxophone/Flute]; Jim Corry [Saxophone]; James Russell [Saxophone] and John 'Boysey' Battrum [Saxophone].